The news from the latest report on state-level employment and unemployment was mixed. The household survey showed sizable employment gains and a downtick in the unemployment rate, while the payroll survey indicated stagnant job growth for the month. The unemployment rate was reported as returning to its January level of 3.7%, down from 3.8% in February. It is probably more accurate to say that the unemployment rate has been unchanged at about 3-3/4% since the start of the year; the recent changes in the reported rate have been nothing more than rounding error. The number of unemployed was down slightly (-469) after having steadily increased since August of 2018. 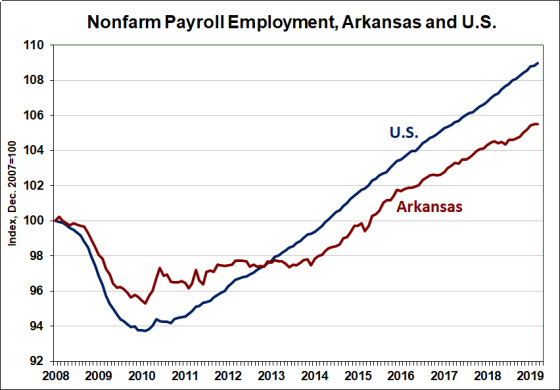 The number of employed Arkansans rose substantially (+2,079) in March, adding to gains recorded in recent months. The total labor force continued to increase as well (+1,610). Over the past year, the household survey shows employment up by 8,585 and the number of unemployed down slightly (-143). Nonfarm payroll employment was essentially unchanged in March, registering an insignificantly small loss (-300) for the month (seasonally adjusted data) . The employment total for February was also revised down slightly (-600). Over the past twelve months, payroll employment has increased by 11,700 jobs. The March statistics showed increases in Construction (+1,100), Leisure & Hospitality Services (+600) and Education & Health Services (+300). Manufacturing and Wholesale Trade each declined by 700 jobs and the Professional & Business Services sector was down by 400 jobs. 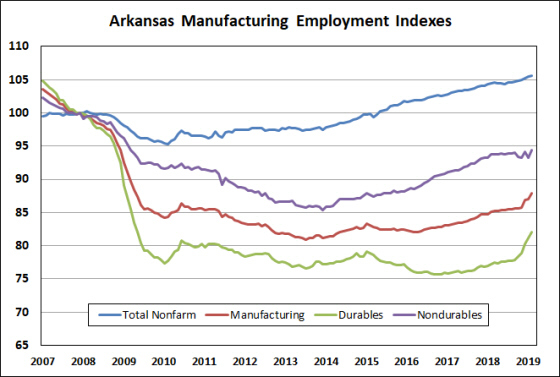 Although manufacturing employment declined from the previous month, it has increased by 4,200 over the past year, accounting for over one-third of the state’s job growth since March 2018. The employment table, below, features a slightly modified format. Rather than looking at the net employment change since the post-recession trough of February 2010, the third column of the table now reports growth since the current period of sustained job growth began: around December 2013. From that baseline, the only sectors that have shown employment declines are Mining & Logging, and Information Services. Education & Health Services have added the most jobs during this period of employment growth (+21,400). Other service-providing sectors have also contributed significantly to total job growth. The revised column three of the table also shows that the resurgence of Manufacturing employment has been a notable feature of the prevailing trend in job growth, not just over the past year. During the period after the “great recession” of 2008-09, manufacturing employment languished for some time and experienced a second significant downturn during the local mini-recession of 2012. The more recent trend of rising employment growth in the manufacturing sector is an encouraging sign of balanced growth across the state’s key sectors and industries. The latest report on unemployment rates in metropolitan areas includes partially revised estimates. Data were revised back to 2014, but the full set of revised figures will not be available until April 19th. 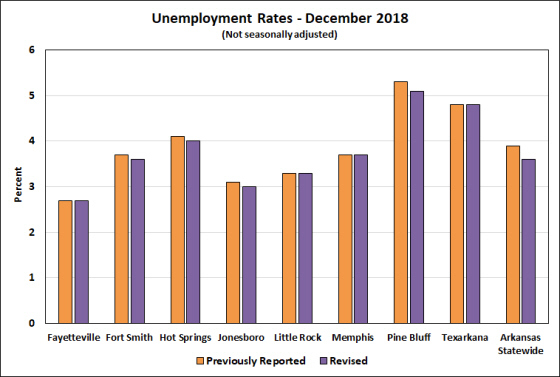 Meanwhile, the figure below illustrates the effect of the revisions on estimates of unemployment rates for December 2018. 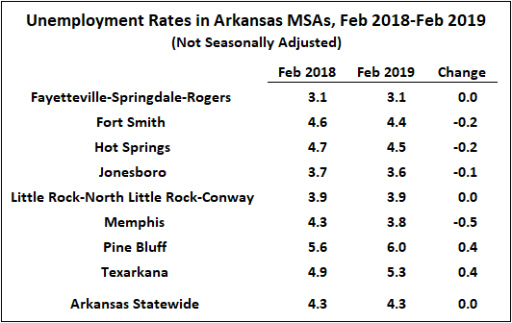 Rates were unchanged for Fayetteville, Little Rock, Memphis and Texarkana, while other metro areas saw slight downward revisions. Preliminary data for January show that rates were generally little changed from the previous year, with the exception of Pine Bluff and Texarkana which both saw increases of 0.7 percentage points over the course of 2018. Relative rankings of unemployment rates among metro areas has been holding steady with Fayetteville, Jonesboro and Little Rock registering rates below the statewide average and with Pine Bluff and Texarkana significantly above the statewide average. 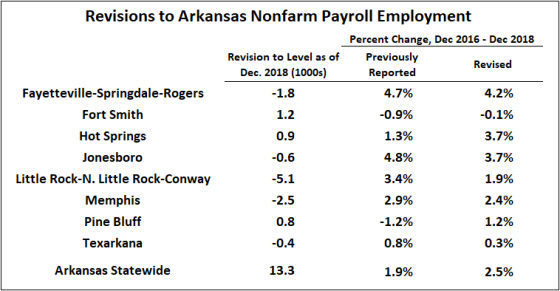 Data on nonfarm payroll employment for metro areas was also revised this week, with some of the revisions substantial. As detailed in the table and figure below, employment levels were revised downward for the fastest-growing metro areas in the state: Fayetteville, Jonesboro, Little Rock, and Memphis. Employment in Texarkana was also adjusted lower. In each of these cases employment growth over the past two years was also revised downward. 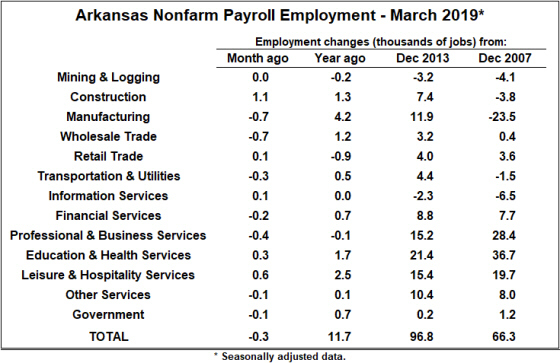 Meanwhile the levels and growth rates of employment were revised higher for Fort Smith, Hot Springs and Pine Bluff. For Pine Bluff, the revisions changed the two year growth from negative to positive. 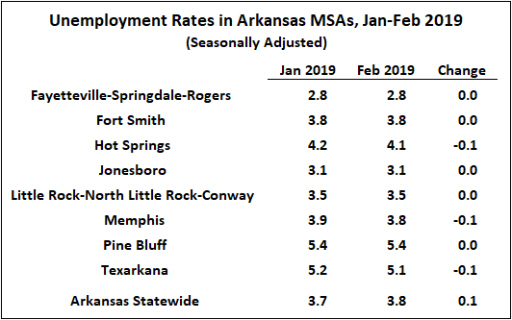 New data for January 2019 showed mixed changes for the month-to-month data, with employment declines in Fayetteville, Little Rock and Pine Bluff. 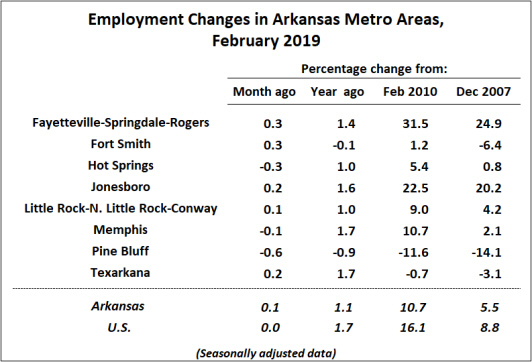 Employment was higher in Fort Smith, Memphis and Texarkana. Incorporating the new revisions, all of Arkansas’ metro areas except for Fort Smith show positive employment growth over the most recent twelve months. 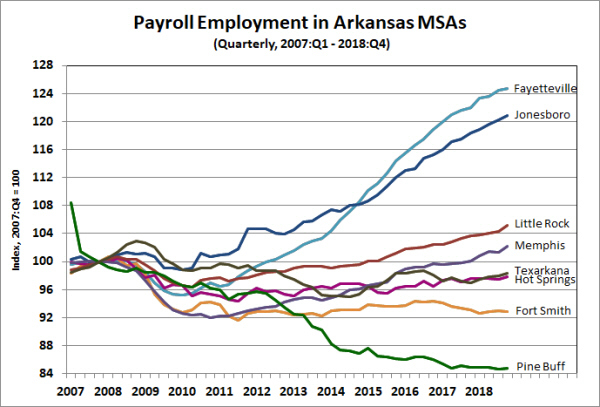 Given the substantial revision to data for 2018, Hot Springs now joins the ranks of metro areas that have higher employment today than before the onset of the “Great Recession” in 2008. 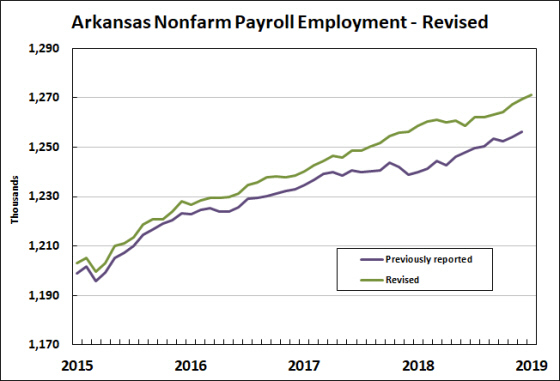 The latest update on state-level employment came out this morning, including the annual benchmark revisions to the payroll employment statistics. The Bureau of Labor Statistics had recently revised and updated the data derived from the household survey – including unemployment rates (reported here). 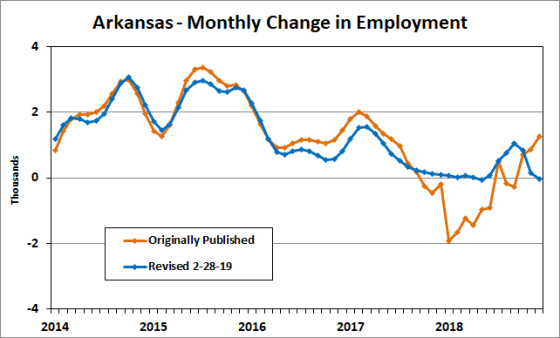 Today’s report showed the Arkansas unemployment rate in January 2019 was unchanged from the (revised) 3.7% level of December 2018. The number of employed was up by 1,334 and the number of unemployed was up by 820, for a total increase in the labor force of 2,154. The labor force participation rate was unchanged at 57.8%. 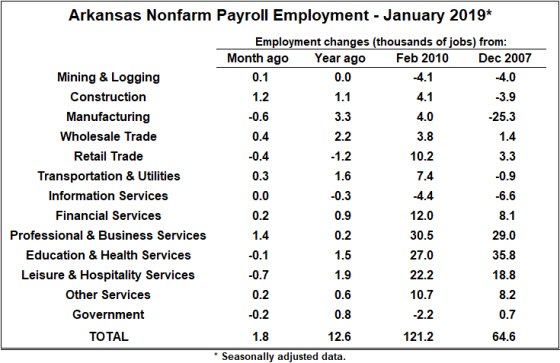 Arkansas nonfarm payroll employment increased by 1,800 jobs in January (seasonally adjusted). The largest contributors to the increase were Construction (+1,200) and Professional & Business Services (+1,400). Prominent declines were recorded in Manufacturing (-600), Retail Trade (-400), and Leisure & Hospitality Services (-700). Compared to a year earlier, employment was up 12,600 jobs (approximately 1.0%). Despite a one-month setback, employment in Manufacturing continues to show strong year-over-year growth (+3,300). Other sectors that have continued to add jobs over the past 12 months include Education and Health services (+1,500) and Leisure & Hospitality Services (+1,900). Professional & Business Services had been trending higher in recent months, but today’s data revision scaled back growth in that sector to show little net change over the past year. Today’s revisions to Nonfarm Payroll Employment were more substantial than usual. The benchmark revisions use data from the Quarterly Census of Employment and Wages to provide more accurate job counts. Typically these revisions affect the data for the most recent 21 months. The recalculation of seasonal adjustment factors usually results in small changes to the reported data as far back as five years. This year’s revisions also included updates to the business “birth/death modeling” which provides estimates of employment changes associated with old firms going out of business and new firms starting up. As a result of these changes, data were revised back–in some cases–all the way back to the start of the time series in 1976. The figure below shows the revisions for total nonfarm payroll employment. Although the levels of employment were revised back several years, most of the impact on employment growth are embodied in the revisions for the past two years. From December 2016 through December 2018, previously published data showed job growth of 23,200 (1.9%). The revised data now indicate job growth of 30,900 (2.5%). 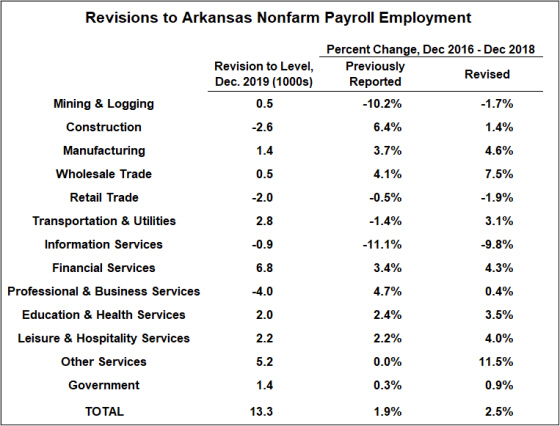 The table below summarizes the impact of the revisions on the level of employment by sector as of December 2018, along with the previously-published and revised growth rates for the period December 2016-December 2018. Substantial upward revisions to the level of employment affected Transportation and Utilities, Financial Services, and Other Services. 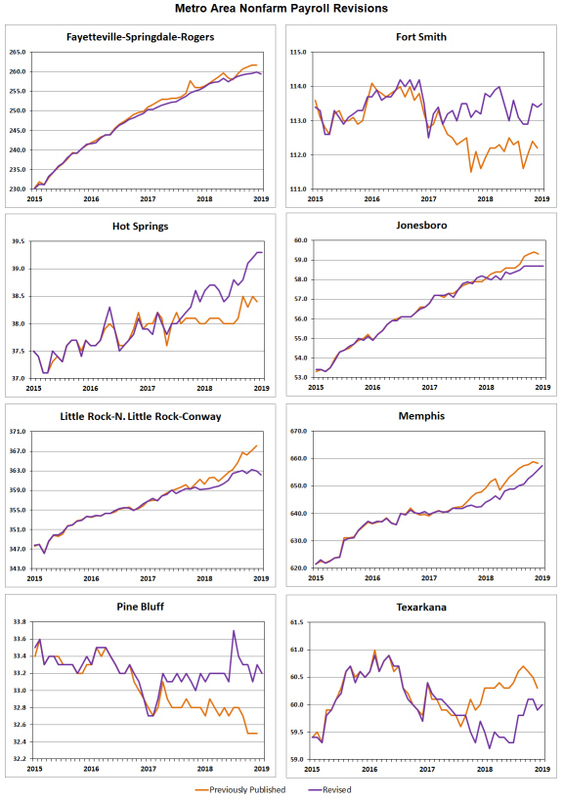 Revisions to recent growth trends were reported for several series. For example, Other Services were previously reported to have had zero growth over the past two years while the revised data show growth of 11.5%. On the other hand, Professional and Business Services had been reported at 4.7% growth over the past two years, while the revised growth figure is only 0.4%. 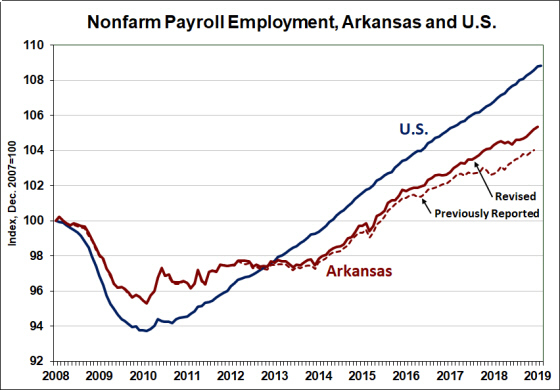 The revised data bring the trend rate of Arkansas employment growth closer to the national average. For the five-year period from December 2013 through December 2018, previously published data indicated an average annual growth rate of 1.36%. The new data show a growth rate of 1.54%. Total nonfarm payroll employment for the U.S. expanded at an annual rate of 1.8% over the same period. The Bureau of Labor Statistics has released revised state unemployment data for 2018, along with annual estimates for household employment and unemployment. 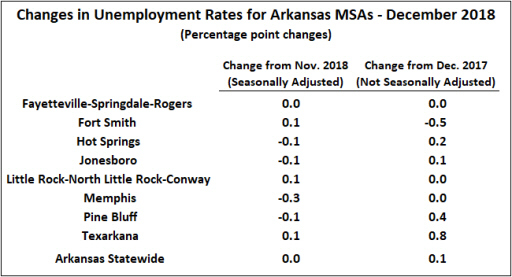 The annual average unemployment rate for Arkansas was 3.7% in 2018, unchanged from the previous year. 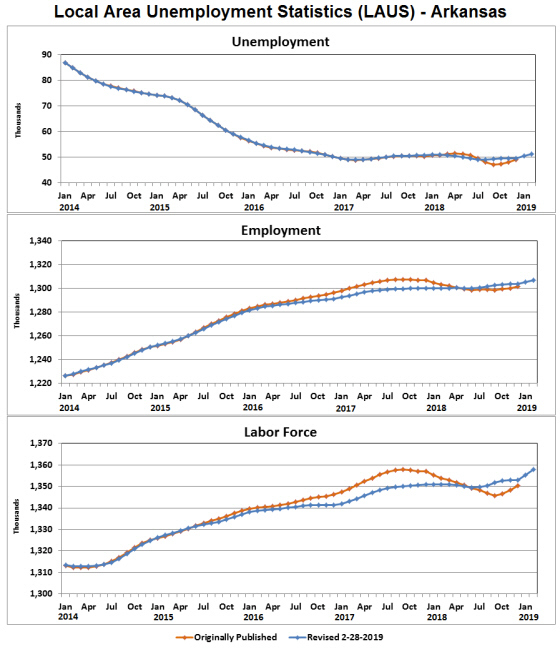 Revisions to monthly estimates of household employment and unemployment were not substantial, but present a somewhat modified view of recent trends. As shown in the figure below, the revised path for the unemployment rate is slightly higher than originally estimated in late 2017, and slightly higher than originally published for late 2018. The revised data show the unemployment rate ending the year at 3.7% rather than the originally-published estimate of 3.6%. Revisions to the underlying data on the number of employed and unemployed had the effect of smoothing out some of the ups-and-downs in recently reported data. 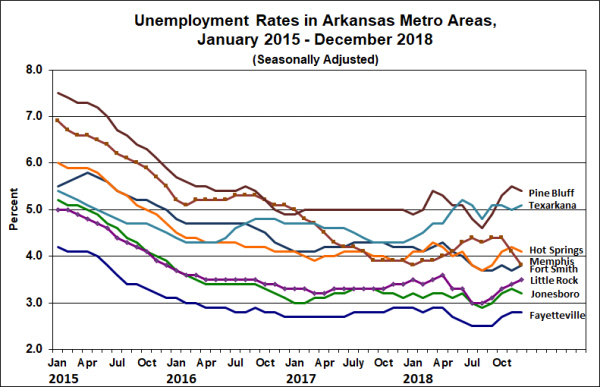 The number of unemployed Arkansans was originally reported to have edged higher in early 2018, fallen over the summer months, then increased once again toward the end of the year. The newly revised data shows a more gradual and steady decline. Similarly, the number of employed is now estimated to have grown more slowly during 2016 and 2017 than originally reported, but the gradual decline reported during 2018 is no longer a feature of the data either. 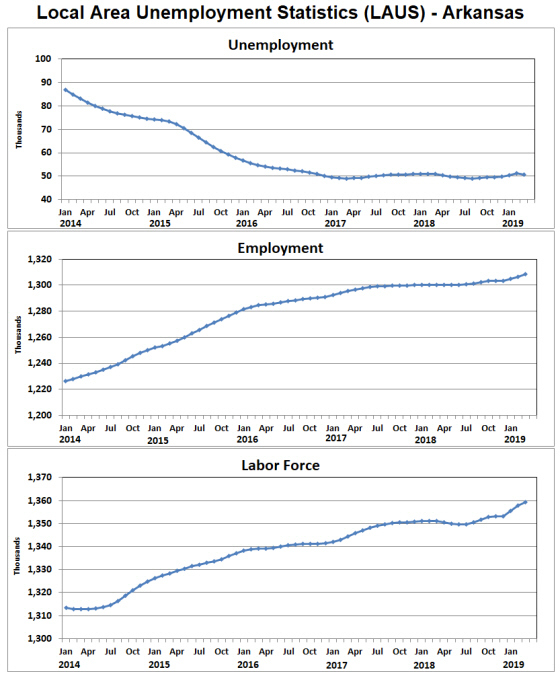 Changes in the data on the total labor force primarily reflect the revisions to the employment estimates. The annual revision of Local Area Unemployment Statistics serves as a reminder that we should never put too much emphasis on short-term fluctuations in the data. For example, from October 2017 through June 2018, the originally published data indicated nine consecutive declines in employment. After the data revision, the only monthly decline during that entire period was a small down-tick in May 2018. 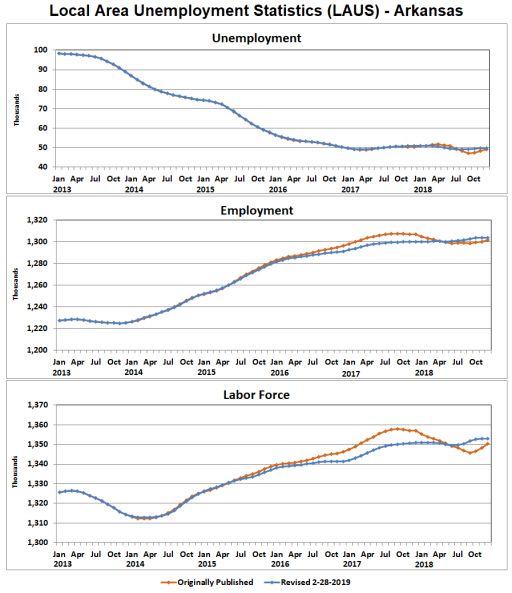 Monthly employment changes in August and September of 2018 were originally reported as declines, but now register as relatively large increases. 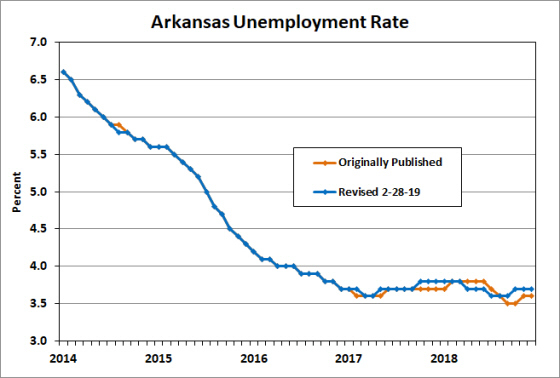 Overall, the revised picture of household employment and unemployment in Arkansas indicates a labor market with an unemployment rate that remains low and relatively stable, with employment growth slowing over time as the capacity for employment expansion is constrained by labor force growth. 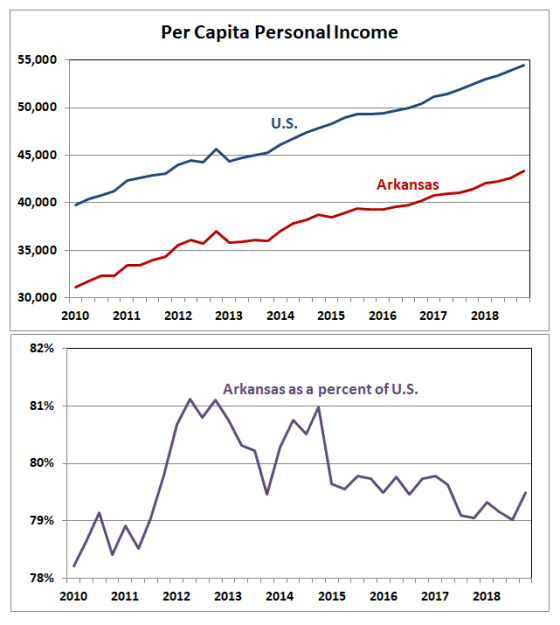 State-level GDP data, released this morning by the Bureau of Economic Analysis, showed Arkansas’ growth rate was 1.9% (annual rate) in the third quarter of 2018. 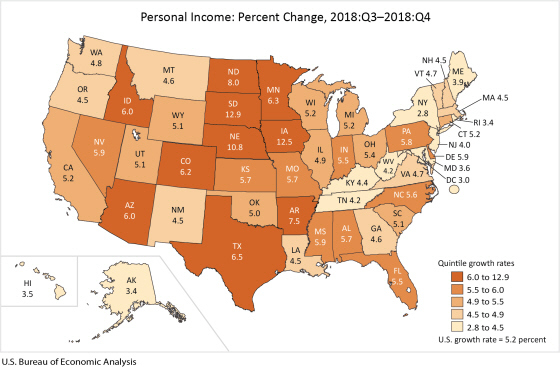 GDP was unchanged or higher in all 50 states, with growth rates ranging from 5.8% in Washington to 0.0% in West Virginia. The national average growth rate for the quarter was 3.4%. 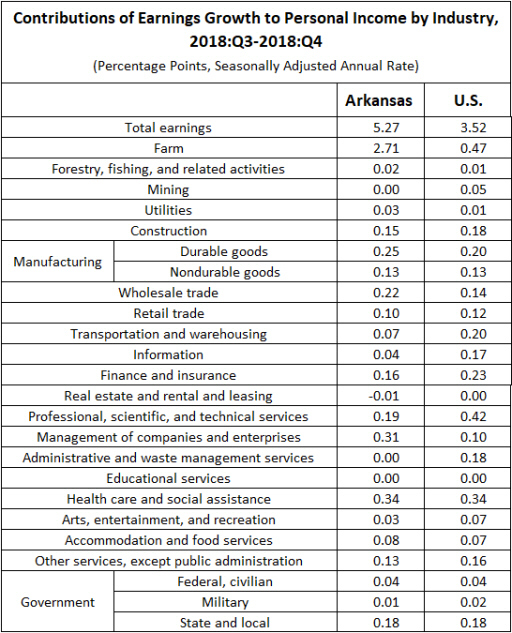 Arkansas’ 1.9% growth rate ranked 46th among the 50 states. 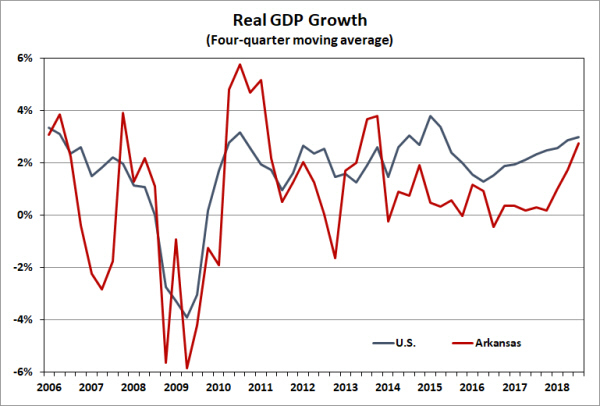 The third quarter expansion marks the fourth consecutive quarter of positive GDP growth in Arkansas. 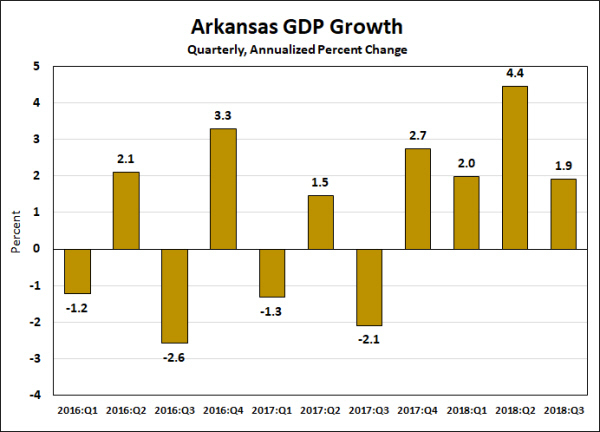 Consequently, Arkansas growth rate on a year-over-year basis has accelerated to 2.8%, just shy of the national average growth rate of 3.0%. Based on four-quarter growth rates, Arkansas ranked #16 among the 50 states. 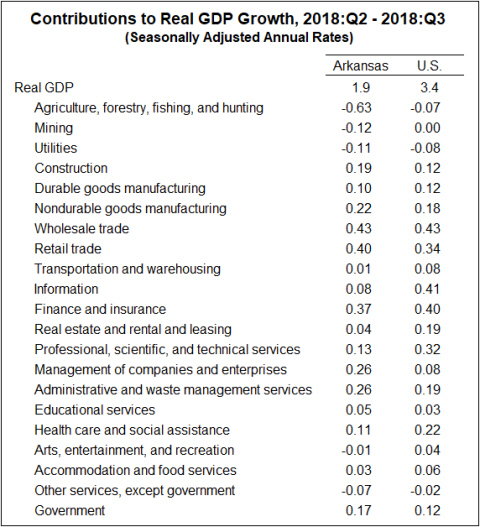 The breakdown of growth by sector for the third quarter shows that Arkansas’ growth followed similar patterns to the nationwide trends. The largest positive contributions to growth came from Wholesale Trade, Retail Trade, and Finance & Insurance. Arkansas also saw significant positive contributions from Management of companies and enterprises and Administrative and waste management services. Sectors subtracting from growth included Agriculture, forestry, fishing and hunting; as well as Mining and Utilities. The next release for state GDP growth, covering the fourth quarter of 2018 and annual averages of the year, is scheduled for May 1. 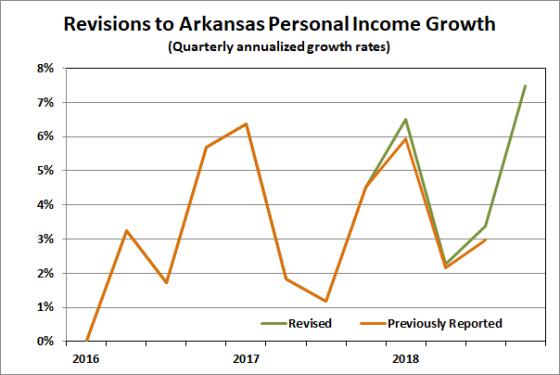 Arkansas Taxable Sales (ATS) increased 1.8% in the fourth quarter of 2018 and was 1.0% higher than the same quarter a year earlier. The growth rate of ATS in 2018 represents a slowdown from the previous trend rate: From 2014 through 2017, ATS expanded at a 3.1% annual rate. Over the entire calendar-year 2018, ATS totaled $59.848 billion, up 2.5% from 2017. 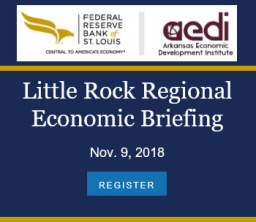 Sources: Department of Finance and Administration, Oil Price Information Service, Arkansas Economic Development Institute. Gasoline prices were trending downward during the fourth quarter. The average price of gasoline was $2.31, down from $2.59 in the third quarter. As a result, consumer expenditures on gasoline are estimated to have fallen by 12.0% in 2018:Q4. 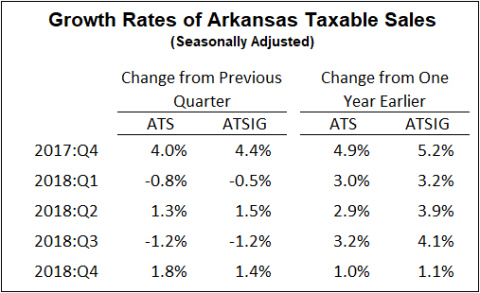 Incorporating this spending category, Arkansas Taxable Sales Including Gasoline (ATSIG) increased by only 1.4% in the fourth quarter. Total spending, including gasoline, was 1.1% higher than in the fourth quarter of 2017. Arkansas Taxable Sales (ATS) is calculated by the Arkansas Economic Development Institute to serve as a timely proxy for Arkansas retail sales. The series is derived from sales and use tax data, adjusting for the relative timing of tax collections and underlying sales, changes in tax laws, and seasonal patterns in the data. 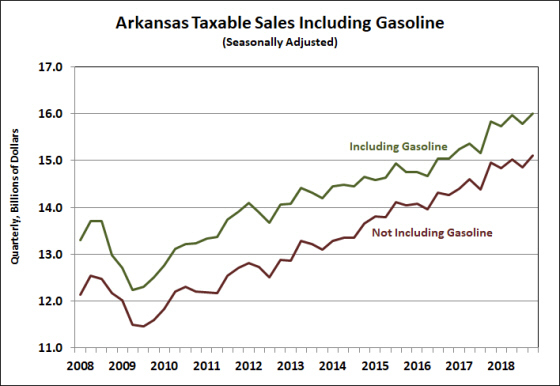 Arkansas Taxable Sales Including Gasoline (ATSIG) incorporates data on the state motor fuel tax and gasoline prices from the Oil Price Information Service. A spreadsheet of the monthly and quarterly data is available here: Arkansas Taxable Sales 2018:Q4 (Excel file).